The answer seems to be yes based on the repairer and Assured Performance figures we interviewed as well as repairers’ ROI comments last week. However, there’s definitely a need for consumer education. Ron Reichen of Precision Auto Body and Paint in Oregon said customers do recognize the value of certification, rather than simply doing a Google search. “They’ll Google ‘auto body’ and then go to the next level,” he said. But the onus is still on the shop to explain the value of certification to a client. Reichen joked that he’s got the “propaganda” proving certification up, and it’s a marketing tool when trying to win business from a competitor. “It’s a no-brainer for the customer,” he said. Gary Wano of G.W. Wano and Sons in Oklahoma, who like Reichen does luxury vehicles as well, said that Club Mercedes members definitely know to check a repairer’s background. Luxury owners in general “understand it’s quite an investment,” and are willing to ensure they have a certified shop, he said. Assured Performance CEO Scott Biggs said consumers do care about certification, “especially when it’s a new vehicle.” The company is developing an app, for example, so insurers and customers can look for certified shops. But has a customer even heard of Assured to know to use the app? Biggs said the company is planning more public awareness about certification in general so Assured and OEM efforts to plug particular shops land home. “We’re not taking anything for granted,” Biggs said. Assured certification Senior Vice President Aaron Clark said more manufacturers are showing interest in collision repair certification, and they’ve already leveraged certified automotive service records to make more money through certified pre-owned programs. 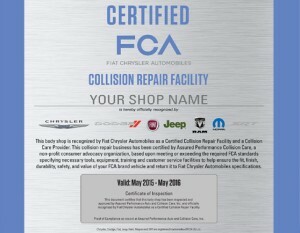 But as for certified collision repair, it’s still a new concept. “We are just now getting to the critical mass that we need” to study its effect, Clark said. And admittedly, customers might look at the state of the shop itself rather than the certification plaques on the wall.